Of the 92 English professional football teams currently in the top 4 leagues only 2 managers (Keith Curle & Chris Powell) are Black, Asian or Minority ethnic (BAME). Disturbing figures it might seem given that approximately 22% of professional players in the 4 leagues are black/mixed race. But not surprising. The English Football Association (FA) has decided to take another look at this situation. Their chairman, Greg Dyke, has even suggested that the Rooney Rule should be considered. Rooney Rule stems from the US NFL American football where teams must interview at least one BAME candidate when hiring a head coach or general manager. Football League chairman Greg Clarke has announced a review on why the take-up of BAME managers seems so low. Tony Collins when at lower league club Rochdale was the first black professional manager in England when he was at the helm from 1960-1967. But it was not until Viv Anderson (1993-94) was appointed player-manager at Barnsley that I first saw a black manager in the football league. It was a big deal to me. I felt disappointed when Viv left the post to become assistant manager to Bryan Robson at Middlesbrough. But symbolic steps do not pay the bills. Former Dutch footballing great, Ruud Gullit took over as manager of Chelsea (1996-1998) and thus became the first black manager of a major English football club. Back then I was excited at Ruud’s appointment -even though I am a QPR fan- and felt proud when he won the FA Cup and gave Chelsea their first major trophy in 26 years. But are there enough good English managers (white or BAME)? I ask given that in the current English Premier League (EPL), of the 22 teams only 9 (40%) have English managers. The league just below the (EPL) -English Championship- has 24 teams of which only 13 (54%) of the managers are home grown. On the European mainland, of the 20 teams in the Spanish top league 15 (75%) of the managers are from Spain. In Italy’s Serie A , 17 (85%) of the 20 teams have Italian managers. The ratio is also 85% in France’s top league and include 2 black managers (Claude Makelele & Antoine Kombouare). 60% of the managers in the German top league are home grown. So until the top 2 leagues in England have at least 70%-75% of their managers being English then the likelihood of English black managers in the top 2 leagues could remain slim. Greg Dyke is championing the NFL’s Rooney rule. But he must wonder why in the US major league soccer’s top league there are no black managers as well. Dyke needs to find out if US soccer chiefs have such concerns. UEFA’s Pro licence is required by anyone who wishes to manage a football club in the top level of the nation’s league system on a permanent basis. The number of German coaches with such a licence stands 1000+, Spain has 2140 such coaches but in England the figure stands just over 200. In order to manage in Europe’s 2 club competitions (Champions & Europa Leagues) managers must have a UEFA Pro-licence. So with the exception of Paul Davis (who works at the FA) all the other above qualified black licencees have had management experience at local or international level. The outcry by some well placed individuals on the low number of such coaches/managers needs to be measured and constructive. See full list of UEFA Pro Licence coaches/managers. So how can we get more black British professional managers/coaches in the top leagues or beyond? Far more BAME coaches should sign up and complete the UEFA Pro Licence programme. Football management has a high turnover rate given the numerous sackings by owners. The average time a manager/head coach (excluding Arsene Wenger) stays at any club in the top 2 English leagues is just over 400 days. Given such a turnover rate, if there were more UEFA Pro licenced BAME coaches then the chances of them gaining football management would be greater. The FA should have a database on their website with profiles of UEFA Pro Licence coaches which clubs owners & agents (local & overseas) can refer to when considering a new manager/coach. Such profiles could include whether the manager/coach is multi-lingual that could appeal to overseas football clubs/nations. Coaches/managers being at least bi-lingual is handy in today’s top European leagues. Qualified coaches/managers need to do more media work. Many out of work/current managers use their media opportunities as pundits or journalists to display their footballing expertise and personality to the public, fans and perspective club owners. Such free publicity is priceless in promoting their skills as good solid communications is a key asset for any modern head coach/manager. Football clubs could be encouraged (but not forced) to publish the names of candidates interviewed for any vacant managerial position that went through an interview process. BAME qualified coaches/managers across Europe should set up a network to get together to learn, share their experiences and provide a mutual supporting platform. In the long term – as more BAME coaches achieve their UEFA Pro Licence status – I am sure there will be more BAME managers/coaches in the English Football Leagues. There is one guarantee though – they all will be sacked at some stage. 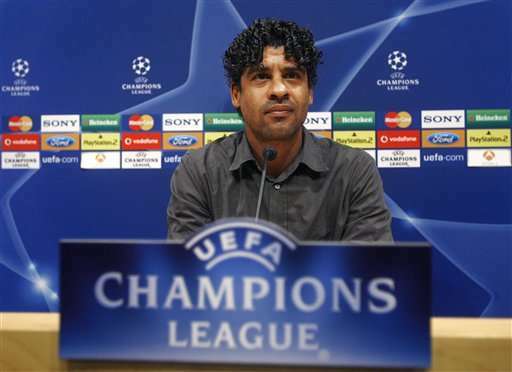 Holland’s Frank Rijkaard – Champions League winner as a player with Milan & Ajax and as a manager with Barcelona 2005/6. Not managed a top European club since he left Barca in 2008. This entry was posted in black history, EPL, football, sports and tagged black managers, english football, EPL, FA, Football Association, football management, Makalele, soccer UK, UEFA. Bookmark the permalink.